The Lewis F. Powell Jr. 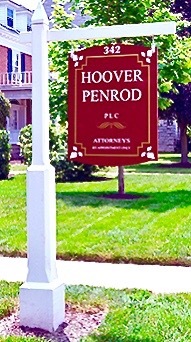 Pro Bono Award this year will be awarded to the Harrisonburg law firm of Hoover Penrod PLC. They noted that every lawyer at the firm assists with pro bono cases for Blue Ridge Legal Services. The ten lawyers have contributed more than 3,200 hours and assisted on more than 560 cases to date. They have provided more than $820,000 in value over twenty-five years. Firm lawyers also volunteer on the Harrisonburg-Rockingham Bar Association’s (HRBA) pro bono Family Law hotline. The Powell award was established by the Special Committee on Access to Legal Services of the Virginia State Bar to honor attorneys and attorney groups that have made outstanding pro bono contributions. This year’s award will be presented October 26 during the Virginia State Bar Pro Bono Conference and Celebration in Hampton.